You've seen the PR photos and read the specs, now Truck Yeah! 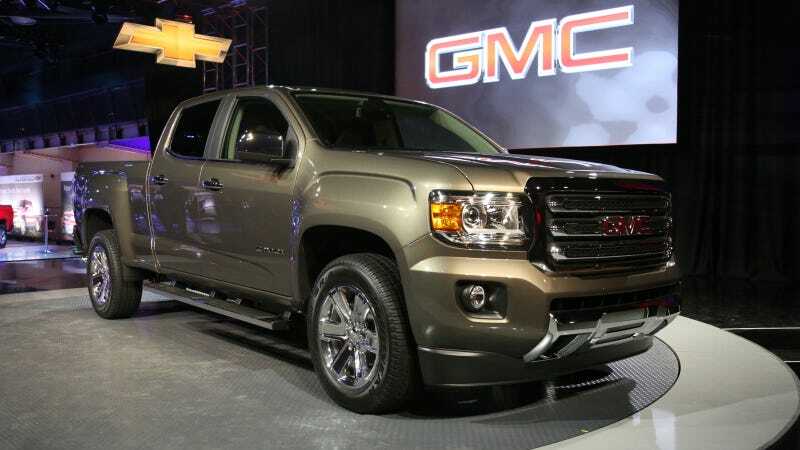 has witnessed the official unveiling of 2015 GMC Canyon. There's now finally a real alternative for those of you who wanted a smaller truck but didn't like the Tacoma or Frontier. If you've got the modern definition of "small" in mind, the Canyon doesn't look enormous from the front. But from the side the truck is a lot longer than I expected, especially in crew cab form. The Sierra-style flat faced grille is significantly more imposing than the Colorado, which in comparison looks a lot more fun loving. The bulging fender flares are also a lot more defined on the Canyon, fan and away the most distinguishing exterior feature besides the grille. The crew cab SLT Canyon that Mark Reuss and Mary Barra delivered their speeches next to was heavy on chrome. The wheels, grille, and running boards, and even lower front bumper were blazing beacons of bling under the stage lights. The extended cab SLE Canyon on display was a flashy in a different way; the meaty tires and tough-looking tubular running boards on the All Terrain package (announced with a large chrome stamp on the front doors and tailgate) appealed a lot more to my dirt-loving sensibilities. The view from the cabin of the Canyon felt just about perfect, if a bit low after riding around in a Ford Raptor all day. For the minute or so I was able to spend behind the wheel (while the truck remained stationary) I got a sense of good ergonomics and visibility. The seats are comfortable, though I felt a bit more play in the fronts by bouncing around then I thought I should have in a vehicle with zero miles on it. Rear seats in the crew cab feature a fold-down center console with cup holders, while the jump seats in the extended cab have secret storage compartments underneath. The leather was nice, the cloth felt a little too spongy to me, and the faux carbon-fiber patterned buckets on the SLE All-Terrain were somewhere in between. The fit and finish of the GMC interior felt superior to that of the Chevy, although these are pre-production showcars so real world results may vary. My biggest complaint on either vehicle would be the steering wheel buttons which felt oddly soft and somehow off-putting, like some kind of retro medical device. There was ample room in both the front and back seats of the crew cab trucks for my six-foot self, until someone sat in the driver's seat who was about the same size. Definitely still workable, but tight. The jump seats on the extended cab would be reserved for short trips or whoever didn't throw down for gas. A GM Marketing Manager named Tony Johnson told me there would be a big drive on accessories for the Canyon and Colorado, including OEM tool boxes and bed-tents. Sounded to me like you might be able to kit out a mini-expedition vehicle when you go through the options list at a GMC or Chevrolet dealer, and I'm keen to look into this further. The touch-screen infotainment system seemed a bit more idiot-proof than Ford's, and the trucks on display were both loaded with USB charging ports. While I couldn't get anyone to promise a mini-Raptor type truck, Johnson cited the S-10 ZR2 as a hot seller in the 90's and admitted an off-road biased Colorado/Canyon was "not beyond the realm of possibility." "We've never sold a truck like this, and nobody's ever bought a truck like this before," remarked GM Executive Vice President and President, North America Mark Reuss. He cited the regulatory environment and price of materials as big drivers of GM's return to the mid-sized pickup market, and emphasized his interest in keeping the automaker "agile." He also assessed that the truck would be built in a "true turn and burn" environment, meaning they'd build to demand rather than a push a pre-determined output on dealers. Despite my pleas to confirm a 4WD diesel manual, he was tight lipped about future drivetrain layouts. He did confirm no Blazer/Jimmy type small box-frame SUV was planned based on the platform of these pickups. However, he announced there would be "a GMC with no Chevrolet underpinnings," which we'll be watching for closely. Nobody from GM was ready to comment on price, but Johnson offered that the Tacoma was their main target and they planed to price their new trucks "right on top of it." Both the Colorado and Canyon are nice little trucks. They feel tiny if you move into one straight out of a Silverado or Suburban, but would more than fulfill the pickup needs of many consumers. Both trucks offer a surprisingly different experience, and are absolutely worth looking at if you're considering a Frontier or Tacoma. Hope to have more for you when they let me take one home for a few days.